On 22 june 2013 the Mount Pleasant Implementation Committee (MPIC) held a self-directed design workshop to test applying charrette methods to the redevelopment of the neighbourhood. On the evening of 24 june the results of the workshop were presented to the public at Our Town Café. On 11 july the products of the workshop were shown at the MPIC meeting. Download a pdf copy of the presentation here. 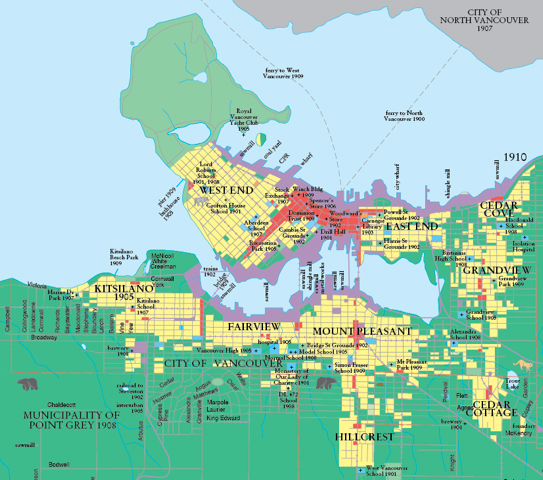 As one of 23 neighbourhoods in the City of Vancouver, all more or less of equal size, the Mount Pleasant share of the Regional Growth Strategy (RGS) targets for 2040 can be estimated as 7,000 persons. This is one twentieth of the 140,000 persons in the RGS. Good urbanism is not just about Density. Historical precedent, the human experience in public space, and neighbourhood-level social functioning must also be taken into account. The triangle block formed by Kingsway, Main and Broadway presents a unique opportunity of place in Mount Pleasant. 42 people turned out on a sunny Sunday afternoon in early May to follow local history raconteur Robert McNutt and urban design practitioners Stephen Bohus and Lewis N. Villegas on a tour of historic Mount Pleasant. The walk was organized in memory of urbanist Jane Jacobs. Download the walk map here. This year the walk was structured around key buildings and places that may guide new construction and planning. The models identified and discussed on the tour included: tall buildings; storefront buildings; apartments; row houses; public open spaces; ‘Great Streets’ and transit implementation options. Detail of an 1886 map showing the subdivision of District Lot 200A acquired in 1871 by Henry Valentine Edmonds (p. 21, Bartholomew Report, 1929). DL 200A extends from the shores of False Creek on the north—note the bridge at Westminster Avenue (Main Street)—to 9th Avenue (Broadway) on the south; and from (future) Cambie Street in the west to Prince Edaward Street in the East. The three east-west streets immediately south of Front Street are named after three governors general of Canada. Streets running north-south are named after all provinces in confederation at the time the plan was registered. [Photo: East Broadway at Prince Edward—the western gateway to the East Broadway District proposed for Mount Pleasant]. Detail from 1910 map in: Vancouver: A Visual History (1992) by Bruce Macdonald. © 2013 Web content copyright of the authors.